Marketers need a common vocabulary and notation for the things we’re doing online. We need to understand the elements that we can introduce and the ways they react with each other. At Conversion Sciences, we stole the notation of chemists. They have a clear notation, like the notation for how vinegar reacts with baking soda. Marketing reactions are like baking soda and vinegar. 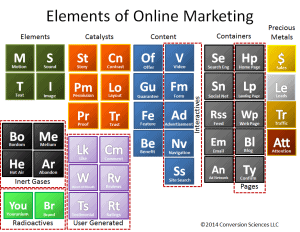 The periodic table of marketing elements. The bottom line is this: We want to get a reaction from our visitors. High bounce rates and exit percentages. The Inert Gases – Bordom, Melium, Hot Air, and Abandon – contaminate the pages on your website and can be detected through your analytics. 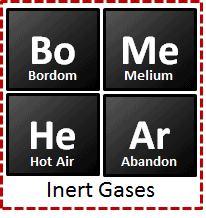 Find out how to eliminate the Inert Gases from your web site with this month’s Marketing Land column, 4 Elemental Problems with Low converting Web Pages. 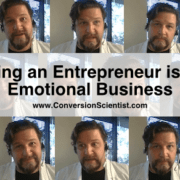 How do I calculate BUU for a long sales-cycle business? How do I factor in profit? How much should I spend to get more revenue from my existing traffic? 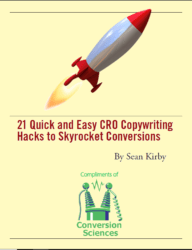 The ultimate question is this: How will small changes in conversion rate affect my yearly revenue? This is the promise of understanding your BUU.